Directive 2010/30/EU requires the Commission to adopt delegated acts as regards the labelling of energy-related products that have a significant potential for energy savings but exhibit a wide disparity in performance levels with equivalent functionality. The energy consumed by space heaters and by combination heaters providing space and water heating, accounts for a significant share of the total energy demand in the Union. Space heaters and combination heaters with equivalent functionality exhibit a wide disparity in terms of energy efficiency. The scope for reducing their energy consumption is significant and includes combining them with appropriate temperature controls and solar devices. Space heaters, combination heaters and packages of such heaters in combination with temperature controls and solar devices should therefore be covered by energy labelling requirements. Space heaters and combination heaters that are designed for using gaseous or liquid fuels predominantly (more than 50 %) produced from biomass have specific technical characteristics which require further technical, economic and environmental analyses. 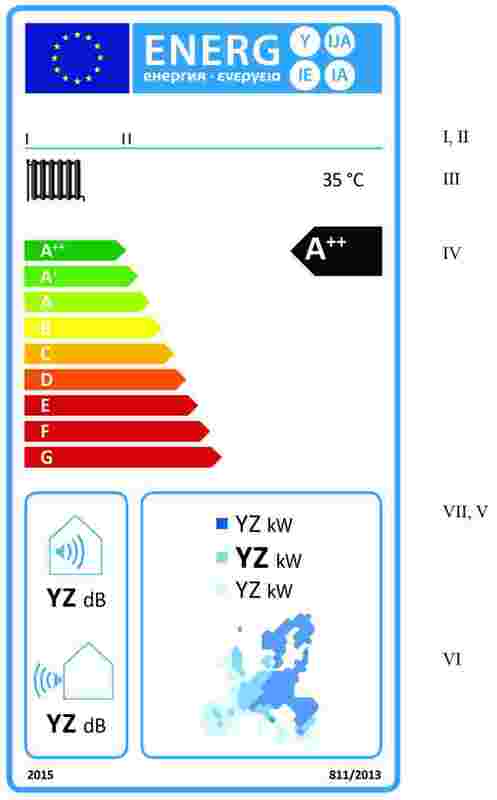 Depending on the outcome of the analyses, energy labelling requirements for those heaters should be set at a later stage, if appropriate. 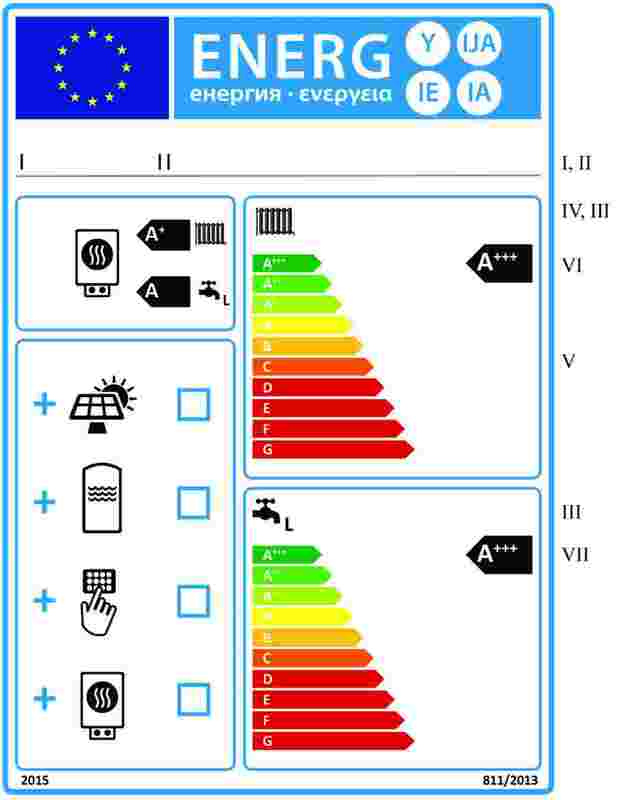 Harmonised provisions should be laid down on labelling and standard product information regarding the energy efficiency of space heaters and combination heaters in order to provide incentives for manufacturers to improve the energy efficiency of these heaters, to encourage end-users to purchase energy-efficient products and to contribute to the functioning of the internal market. 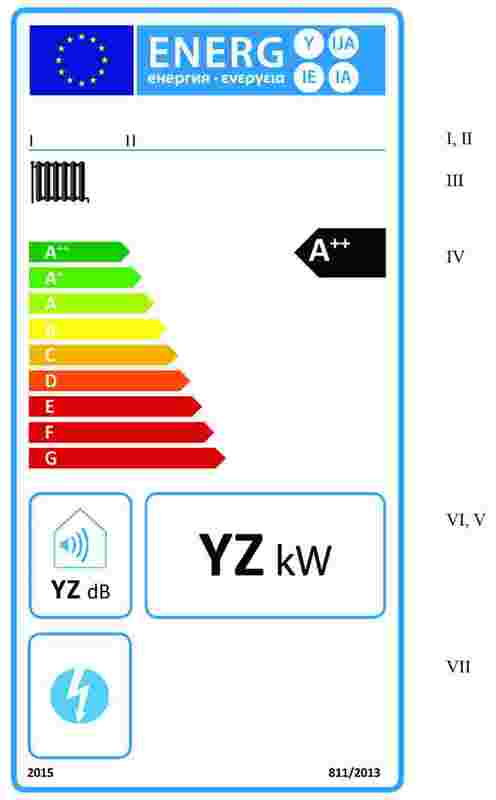 As regards significant energy and cost savings for each type of heater, this Regulation should introduce a new labelling scale from A++ to G for the space heating function of boiler space heaters, cogeneration space heaters, heat pump space heaters, boiler combination heaters and heat pump combination heaters. While classes A to G cover the various types of conventional boilers when not combined with cogeneration or renewable energy technologies, classes A+ and A++ should promote the use of cogeneration and renewable energy sources. 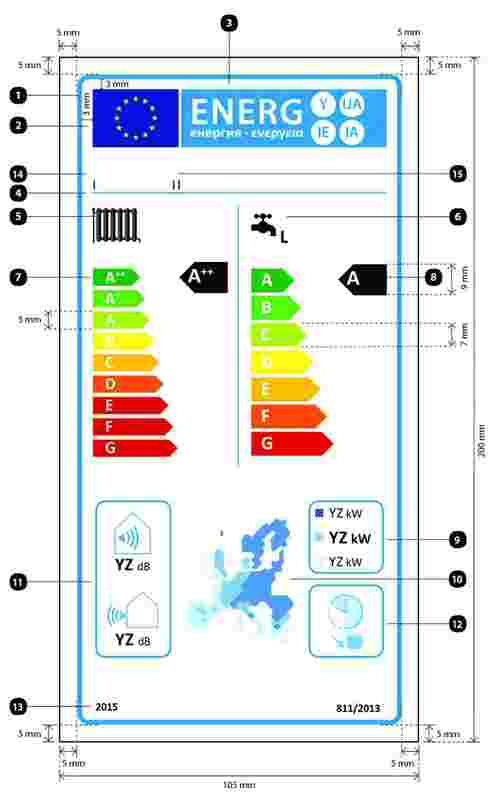 Furthermore, a new A-G labelling scale should be introduced for the water heating function of boiler combination heaters and heat pump combination heaters, in line with Commission Delegated Regulation (EU) No 812/2013 of 18 February 2013 supplementing Directive 2010/30/EU of the European Parliament and of the Council with regard to the energy labelling of water heaters, hot water storage tanks and packages of water heater and solar device (2). 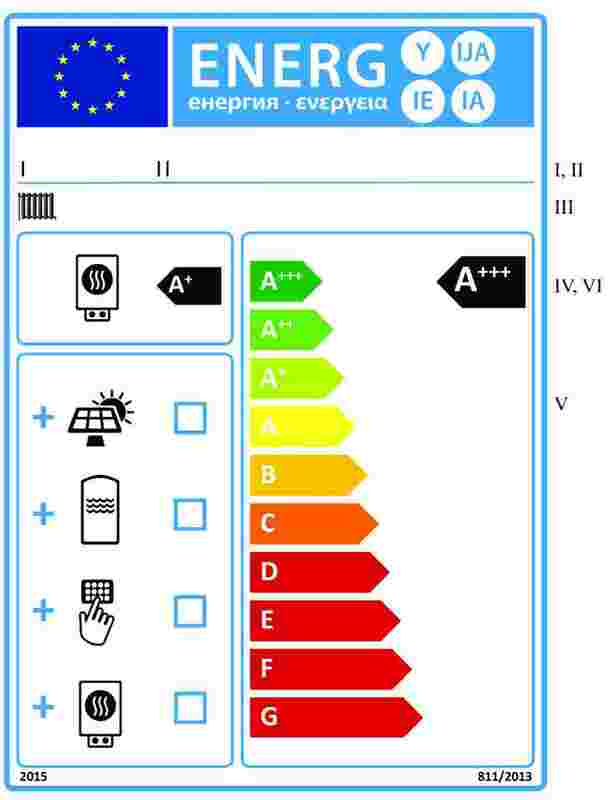 Further classes A+++ and A+ should be added after four years to the seasonal space heating and water heating classes, respectively, unless the review of the Regulation proves otherwise, to accelerate the market penetration of high-efficiency space heaters and combination heaters using renewable energy sources. 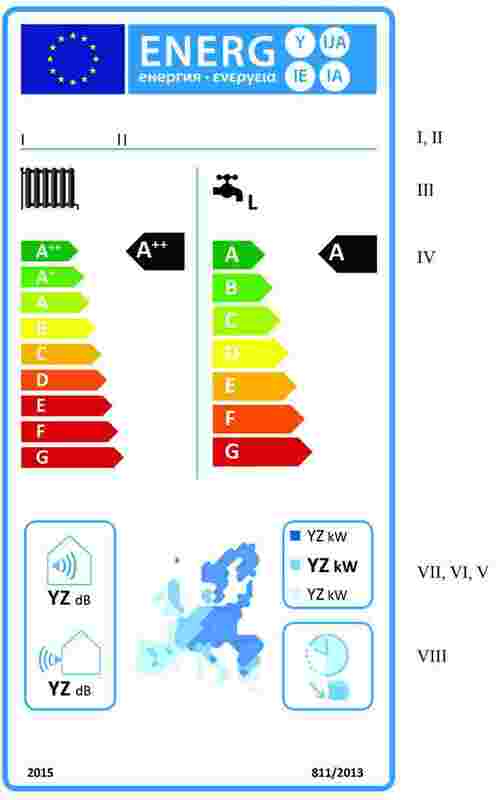 This Regulation should ensure that consumers get more accurate comparative information about the performance of heat pump heaters, based on a seasonal efficiency calculation and measurement method for three European climate zones. The Commission mandated the European standardisation bodies to investigate whether a similar method should be developed for other heaters. European standardised heating seasons for boiler heaters, cogeneration heaters and solar heaters could be considered in the review of this Regulation. The sound power level of a heater can be an important consideration for end-users. Information on sound power levels should be included on the labels of space heaters and combination heaters. The combined effect of this Regulation and Commission Regulation (EU) No 813/2013 of 2 August 2013 implementing Directive 2009/125/EC of the European Parliament and of the Council with regard to ecodesign requirements for space heaters and combination heaters (3) is expected to result in estimated annual energy savings of around 1 900 PJ (about 45 Mtoe) by 2020, corresponding to about 110 Mt CO2 emissions, compared to what would happen if no measures were taken. The information provided on the label should be obtained through reliable, accurate and reproducible measurement and calculation procedures that take into account recognised state-of-the-art measurement and calculation methods including, where available, harmonised standards adopted by the European standardisation bodies under a request from the Commission, in accordance with the procedures laid down in the Directive 98/34/EC of the European Parliament and of the Council of 22 June 1998 laying down a procedure for the provision of information in the field of technical standards and regulations and of rules on Information Society services (4), for the purpose of establishing ecodesign requirements. This Regulation should specify a uniform design and content of product labels for space heaters and combination heaters. In addition, this Regulation should specify requirements for the product fiche and technical documentation for space heaters and combination heaters. Moreover, this Regulation should specify requirements for the information to be provided for any form of distance selling of space heaters and combination heaters and in any advertisements and technical promotional material for such heaters. In addition to the product labels and fiches for stand-alone space heaters and combination heaters laid down in this Regulation, package labels and fiches based on product fiches from suppliers should ensure that the end-user has easy access to information on the energy performance of packages of heaters combined with solar devices and/or temperature controls. The most efficient class A+++ may be reached by such a package. 1. This Regulation establishes requirements for the energy labelling of, and the provision of supplementary product information on, space heaters and combination heaters with a rated heat output ≤ 70 kW, packages of space heater ≤ 70 kW, temperature control and solar device and packages of combination heater ≤ 70 kW, temperature control and solar device. cogeneration space heaters with a maximum electrical capacity of 50 kW or above. 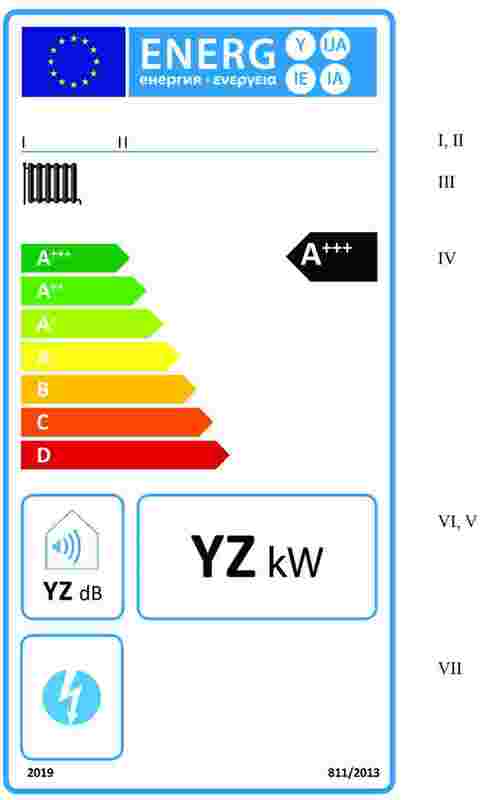 ‘sound power level’ (LWA ) means the A-weighted sound power level, indoors and/or outdoors, expressed in dB. 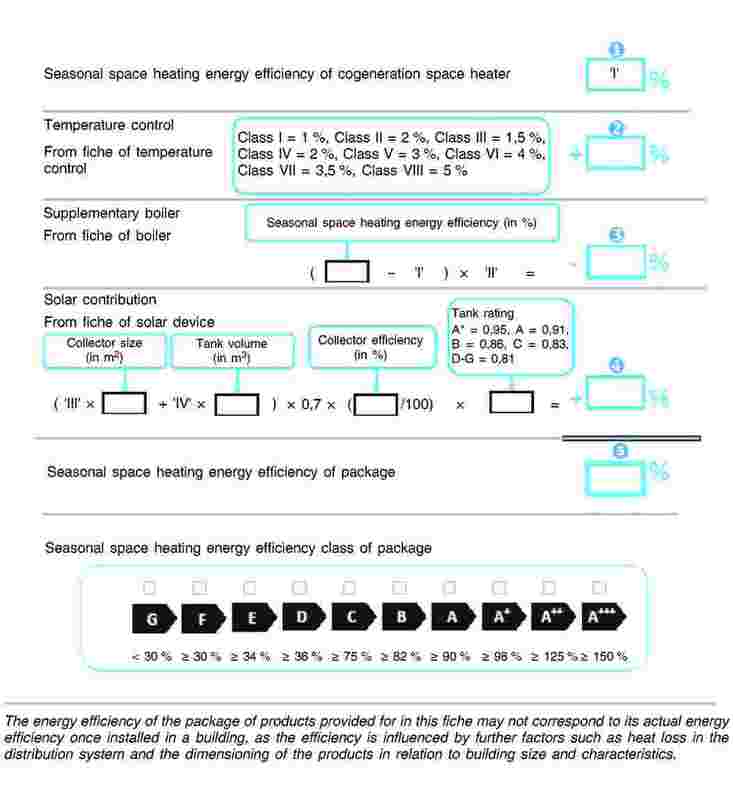 For the purposes of Annexes II to VIII, additional definitions are set out in Annex I.
any technical promotional material concerning a specific space heater model and describing its specific technical parameters includes a reference to the seasonal space heating energy efficiency class under average climate conditions for that model. From 26 September 2019 a printed label complying with the format and content of information set out in point 1.2 of Annex III shall be provided for each space heater conforming to the seasonal space heating energy efficiency classes set out in point 1 of Annex II, whereby: for heat pump space heaters, the printed label shall be provided at least in the packaging of the heat generator. any technical promotional material concerning a specific combination heater model and describing its specific technical parameters includes a reference to the seasonal space heating energy efficiency class and water heating energy efficiency class under average climate conditions for that model. 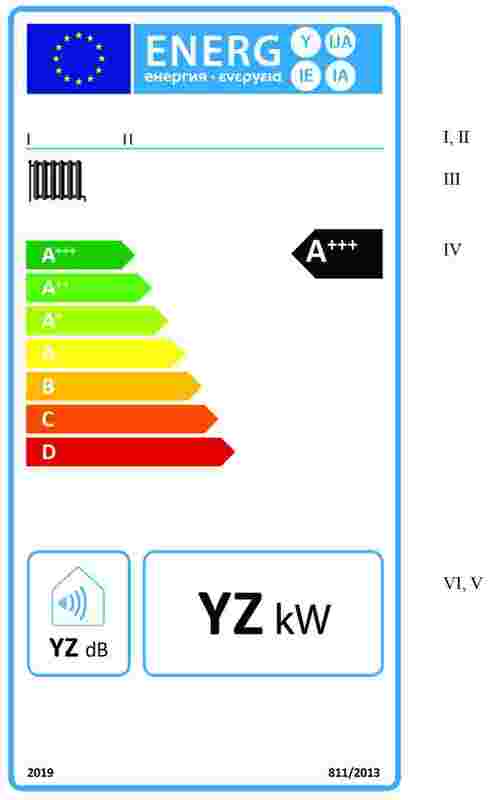 From 26 September 2019 a printed label complying with the format and content of information set out in point 2.2 of Annex III shall be provided for each combination heater conforming to the seasonal space heating energy efficiency classes and water heating energy efficiency classes set out in points 1 and 2 of Annex II, whereby: for heat pump combination heaters, the printed label shall be provided at least in the packaging of the heat generator. the technical documentation, as set out in point 3 of Annex V, is provided on request to the authorities of the Member States and to the Commission. the technical documentation, as set out in point 4 of Annex V, is provided on request to the authorities of the Member States and to the Commission. any technical promotional material concerning a specific package of space heater, temperature control and solar device model and describing its specific technical parameters includes a reference to the seasonal space heating energy efficiency class under average climate conditions for that model. any technical promotional material concerning a specific package of combination heater, temperature control and solar device model and describing its specific technical parameters includes a reference to the seasonal space heating energy efficiency class and water heating energy efficiency class under average climate conditions for that model. The information to be provided pursuant to Articles 3 and 4 shall be obtained by reliable, accurate and reproducible measurement and calculation methods which take into account the recognised state-of-the-art measurement and calculation methods, as set out in Annex VII. Member States shall apply the procedure set out in Annex VIII when assessing the conformity of the declared seasonal space heating energy efficiency class, water heating energy efficiency class, seasonal space heating energy efficiency, water heating energy efficiency and sound power level of heaters. The Commission shall review this Regulation in the light of technological progress no later than five years after its entry into force. 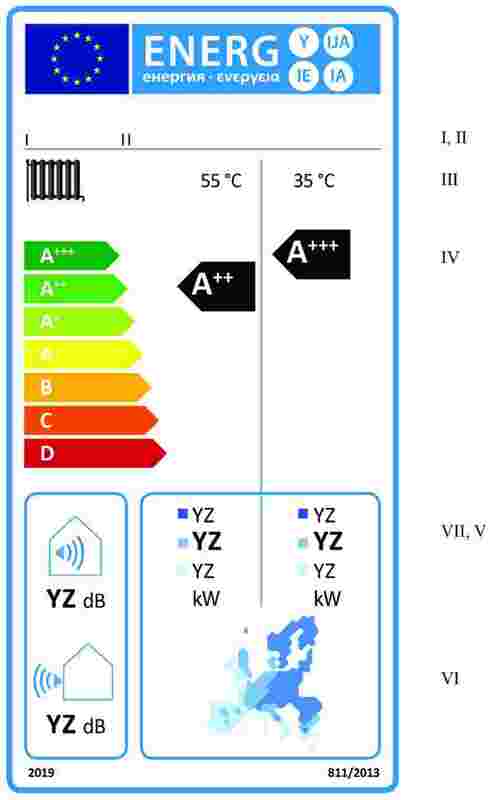 The review shall in particular assess any significant changes in the market shares of various types of heaters related to the labels set out in points 1.2. and 2.2. of Annex III, the feasibility and usefulness of indicating heater efficiency other than heat pump efficiency based on standardised heating seasons, the appropriateness of the package fiches and labels set out in points 3 and 4 of Annex III and points 5 and 6 of Annex IV, and the appropriateness of including passive flue heat recovery devices in the scope of this Regulation. (2) See page 83 of this Official Journal. (3) See page 136 of this Official Journal. (4) OJ L 204, 21.7.1998, p. 37. ‘model identifier’ means the code, usually alphanumeric, which distinguishes a specific space heater, combination heater, temperature control, solar device, package of space heater, temperature control and solar device, or package of combination heater, temperature control and solar device model from other models with the same trade mark, supplier’s name or dealer’s name. (1) OJ L 315, 14.11.2012, p. 1. The seasonal space heating energy efficiency class of a heater, with the exception of low-temperature heat pumps and heat pump space heaters for low-temperature application, shall be determined on the basis of its seasonal space heating energy efficiency as set out in Table 1. 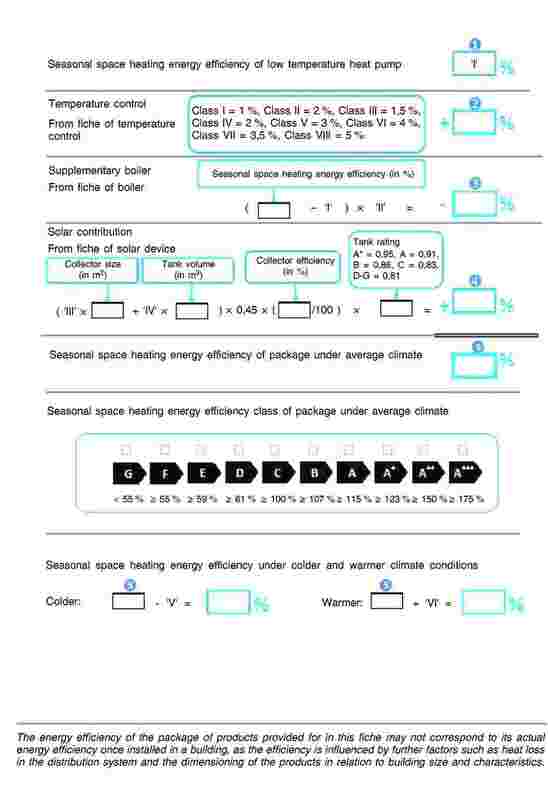 The seasonal space heating energy efficiency classes of a low-temperature heat pump and a heat pump space heater for low-temperature application shall be determined on the basis of its seasonal space heating energy efficiency as set out in Table 2. 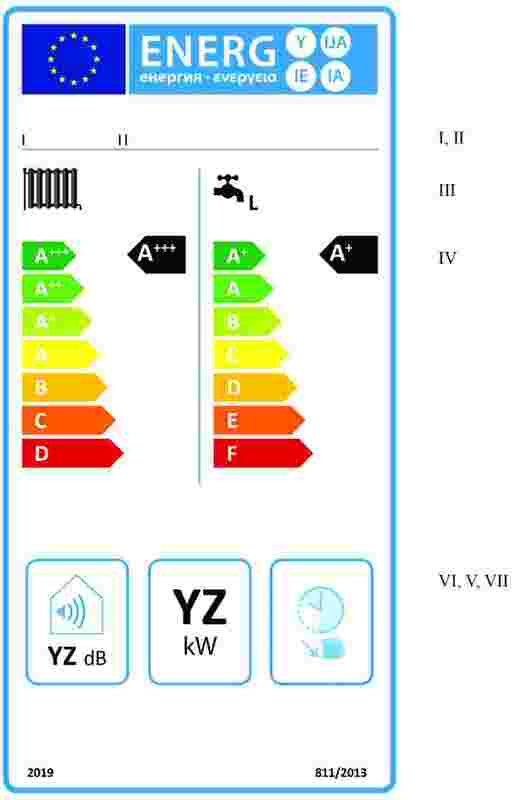 The seasonal space heating energy efficiency of a heater shall be calculated in accordance with points 3 and 4 of Annex VII, for heat pump space heaters, heat pump combination heaters and low-temperature heat pumps under average climate conditions. 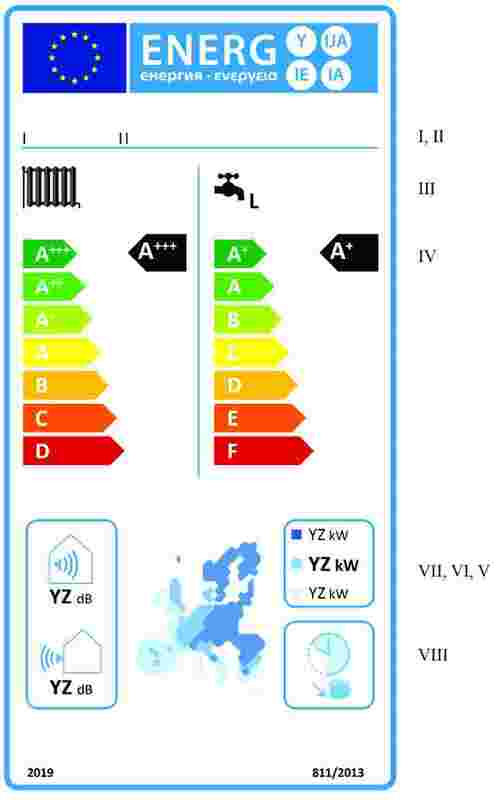 The water heating energy efficiency class of a combination heater shall be determined on the basis of its water heating energy efficiency as set out in Table 3. 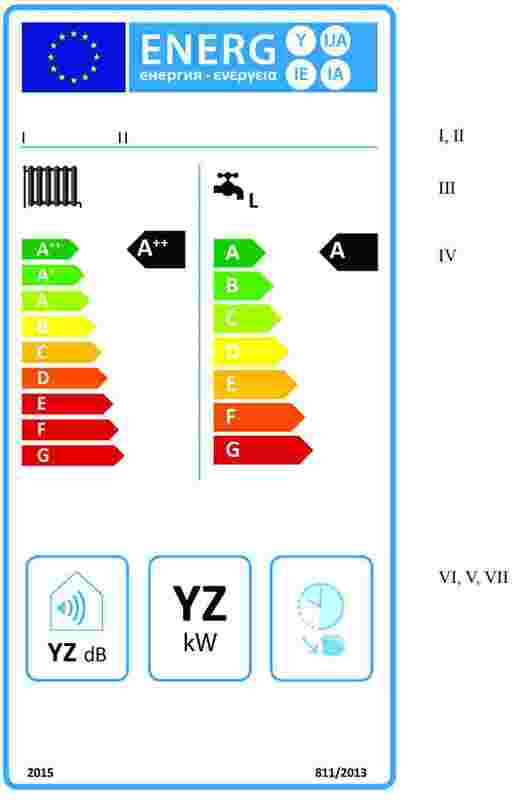 The water heating energy efficiency of a combination heater shall be calculated in accordance with point 5 of Annex VII. 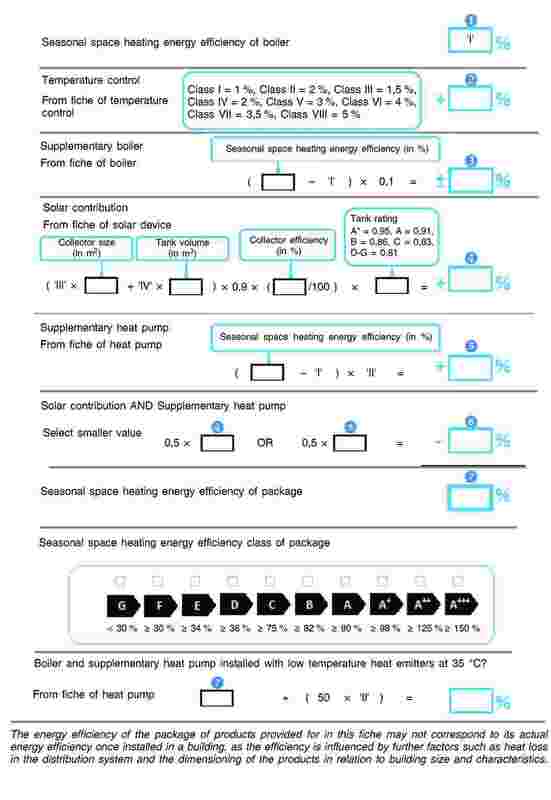 The energy efficiency class of a solar hot water storage tank, if (part of) a solar device, shall be determined on the basis of its standing loss as set out in Table 4.
the sound power level LWA , indoors, in dB, rounded to the nearest integer. The design aspects of the label for boiler space heaters shall be in accordance with point 5 of this Annex. the additional electricity generation function. The design aspects of the label for cogeneration space heaters shall be in accordance with point 6 of this Annex. the sound power level LWA , indoors (if applicable) and outdoors, in dB, rounded to the nearest integer. 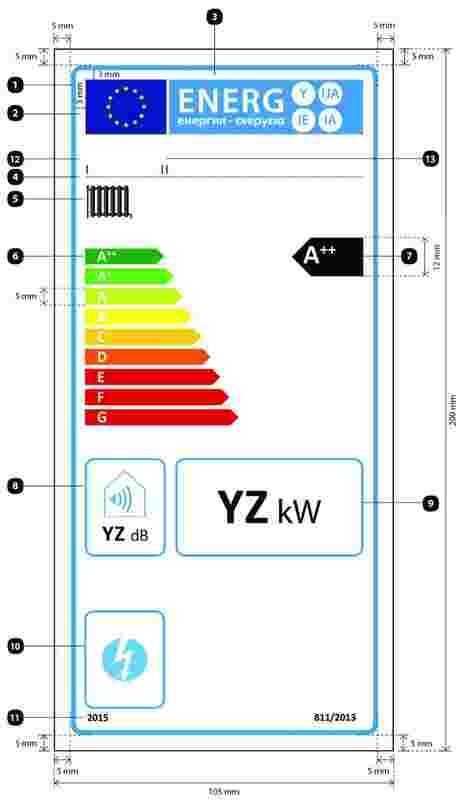 The design aspects of the label for heat pump space heaters shall be in accordance with point 7 of this Annex. By way of exception, where a model has been granted an ‘EU Ecolabel’ under Regulation (EC) No 66/2010 of the European Parliament and of the Council (1), a copy of the EU Ecolabel may be added. 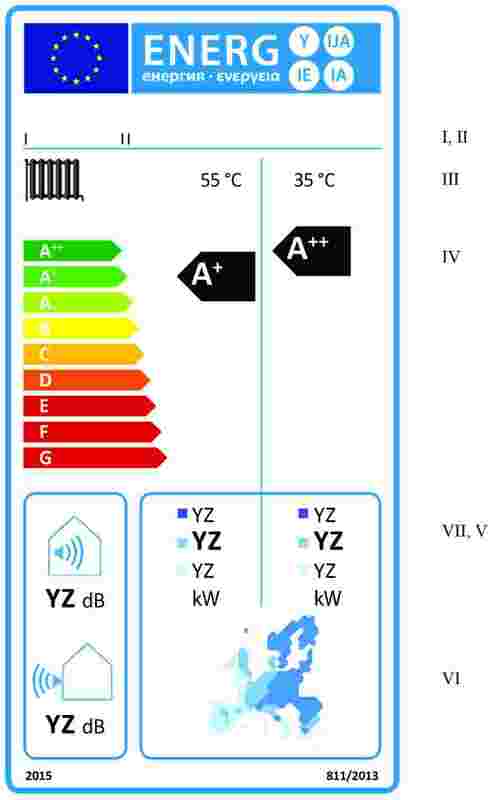 The design aspects of the label for low-temperature heat pumps shall be in accordance with point 8 of this Annex. By way of exception, where a model has been granted an ‘EU Ecolabel’ under Regulation (EC) No 66/2010 of the European Parliament and of the Council, a copy of the EU Ecolabel may be added. The information listed in point 1.1.1(a) of this Annex shall be included in the label. The information listed in point 1.1.2(a) of this Annex shall be included in the label. The information listed in point 1.1.3(a) of this Annex shall be included in the label. 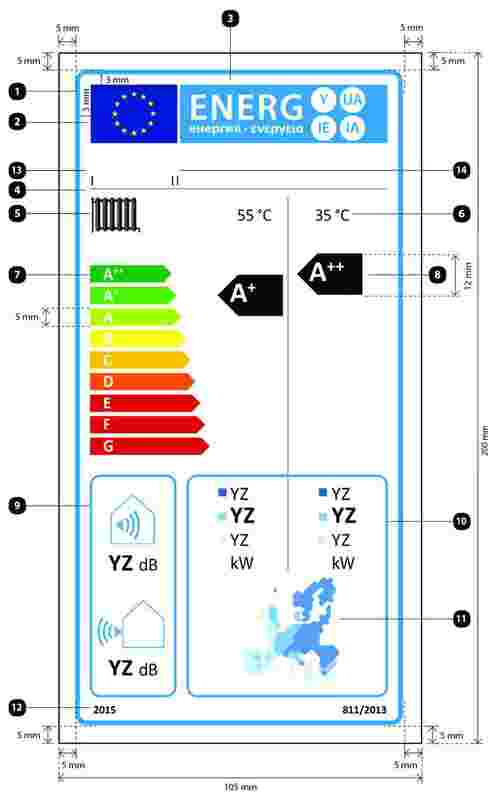 The design aspects of the label for heat pump space heaters shall be in accordance with point 7 of this Annex. The information listed in point 1.1.4(a) of this Annex shall be included in the label. 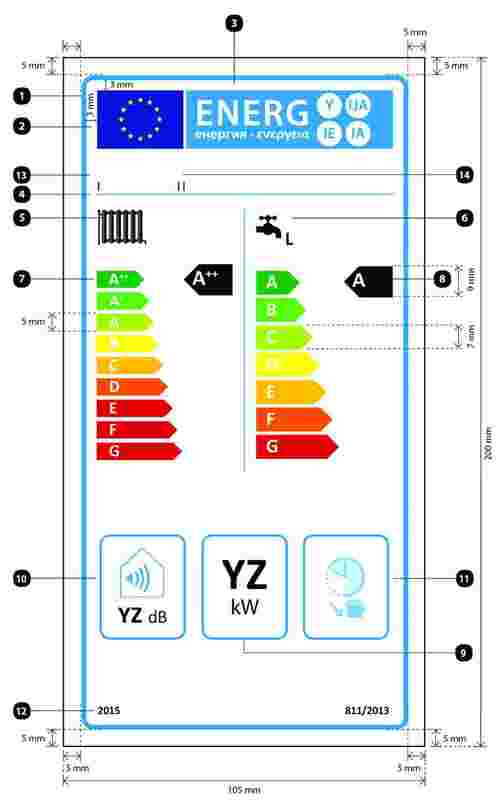 The design aspects of the label for low-temperature heat pumps shall be in accordance with point 8 of this Annex. for boiler combination heaters able to work only during off-peak hours, the pictogram referred to in point 9(d)(11) of this Annex may be added. The design aspects of the label for boiler combination heaters shall be in accordance with point 9 of this Annex. for heat pump combination heaters able to work only during off-peak hours, the pictogram referred to in point 10(d)(12) of this Annex may be added. The design aspects of the label for heat pump combination heaters shall be in accordance with point 10 of this Annex. The information listed in point 2.1.1(a) of this Annex shall be included in the label. The information listed in point 2.1.2(a) of this Annex shall be included in the label. the seasonal space heating energy efficiency class of the package of space heater, temperature control and solar device, determined in accordance with point 5 of Annex IV; the head of the arrow containing the seasonal space heating energy efficiency class of the package of space heater, temperature control and solar device shall be placed at the same height as the head of the relevant energy efficiency class. The design aspects of the label for packages of space heater, temperature control and solar device shall be in accordance with point 11 of this Annex. For packages of space heater, temperature control and solar device in seasonal space heating energy efficiency classes A+++ to D, the last classes E to G in the A+++ to G scale may be omitted. 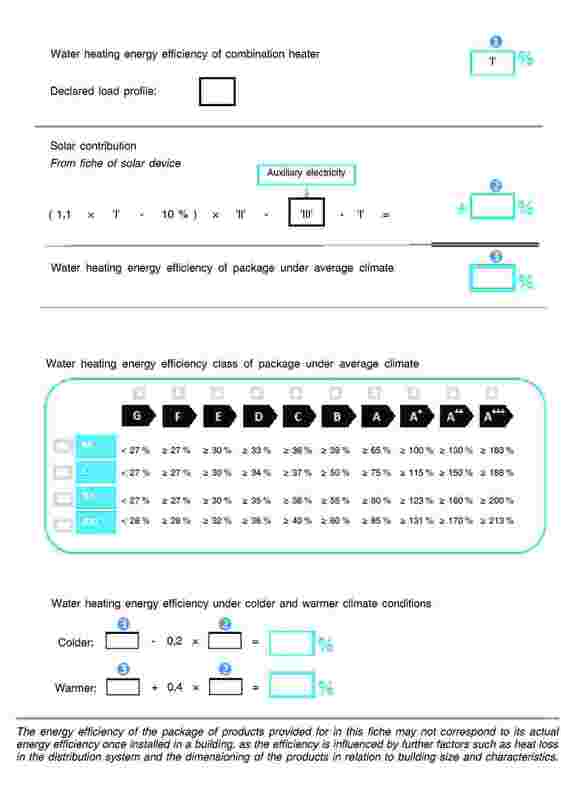 the water heating energy efficiency class of the package of combination heater, temperature control and solar device, determined in accordance with point 6 of Annex IV; the head of the arrow containing the water heating energy efficiency class of the package of combination heater, temperature control and solar device shall be placed at the same height as the head of the relevant energy efficiency class. The design aspects of the label for packages of combination heater, temperature control and solar device shall be in accordance with point 12 of this Annex. For packages of combination heater, temperature control and solar device in seasonal space heating and/or water heating energy efficiency classes A+++ to D, the last classes E to G in the A+++ to G scale may be omitted. The label shall be at least 105 mm wide and 200 mm high. Where the label is printed in a larger format, its content shall nevertheless remain proportionate to the specifications above. The background shall be white. Colours are coded as CMYK — cyan, magenta, yellow and black, following this example: 00-70-X-00: 0 % cyan, 70 % magenta, 100 % yellow, 0 % black. EU label border stroke: 4 pt, colour: cyan 100 %, round corners: 3,5 mm. EU logo: Colours: X-80-00-00 and 00-00-X-00. Energy label: Colour: X-00-00-00. 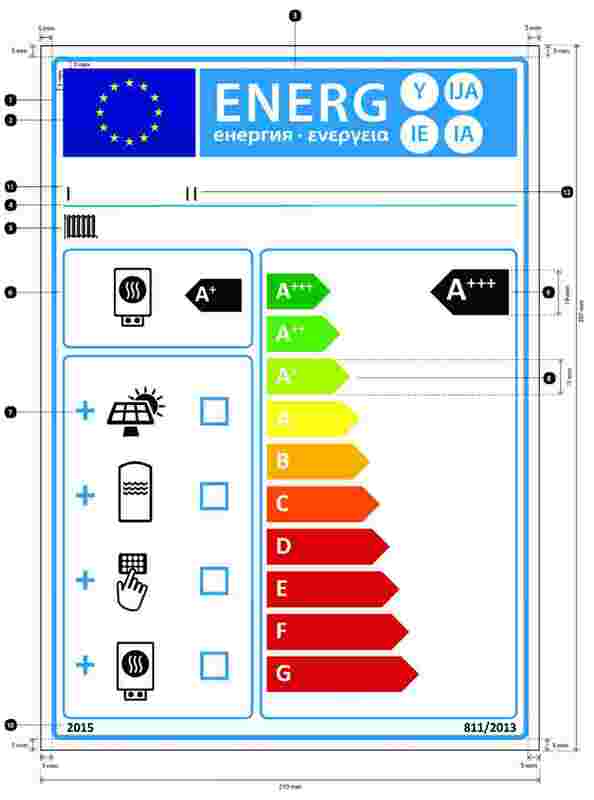 Pictogram as depicted: EU logo + energy label: width: 86 mm, height: 17 mm. Sub-logos border: 1 pt, colour: cyan 100 %, length: 86 mm. Text: Calibri bold 16 pt, capitals, white, ‘+’ symbols: superscript, aligned on a single row. Text: Calibri bold 24 pt, capitals, white, ‘+’ symbols: superscript, aligned on a single row. Text ‘dB’: Calibri regular 15 pt, 100 % black. Text ‘kW’: Calibri regular 30 pt, 100 % black. Text: Calibri bold 10 pt. The supplier’s name or trade mark and model identifier shall fit in a space of 86 × 12 mm. Border: 2 pt, colour: cyan 100 %, round corners: 3,5 mm. Text ‘55 °C’ and ‘35 °C’: Calibri regular 14 pt, 100 % black. Text ‘kW’: Calibri regular 15 pt, 100 % black. Text ‘35 °C’: Calibri regular 14 pt, 100 % black. Text ‘kW’: Calibri regular 13,5 pt, 100 % black. Pictogram as depicted, including the declared load profile expressed as the appropriate letter in accordance with Table 15 of Annex VII: Calibri bold 16 pt, 100 % black. Text: Calibri bold 18 pt, capitals, white, ‘+’ symbols: superscript, aligned on a single row. Text ‘kW’: Calibri regular 18 pt, 100 % black. Border: 2 pt – colour: cyan 100 % – round corners: 3,5 mm. Text ‘kW’: Calibri regular 10 pt, 100 % black. Text ‘dB’: Calibri regular 10 pt, 100 % black. The label shall be at least 210 mm wide and 297 mm high. Where the label is printed in a larger format, its content shall nevertheless remain proportionate to the specifications above. EU label border stroke: 6 pt, colour: cyan 100 %, round corners: 3,5 mm. Energy label: Colour: X-00-00-00. 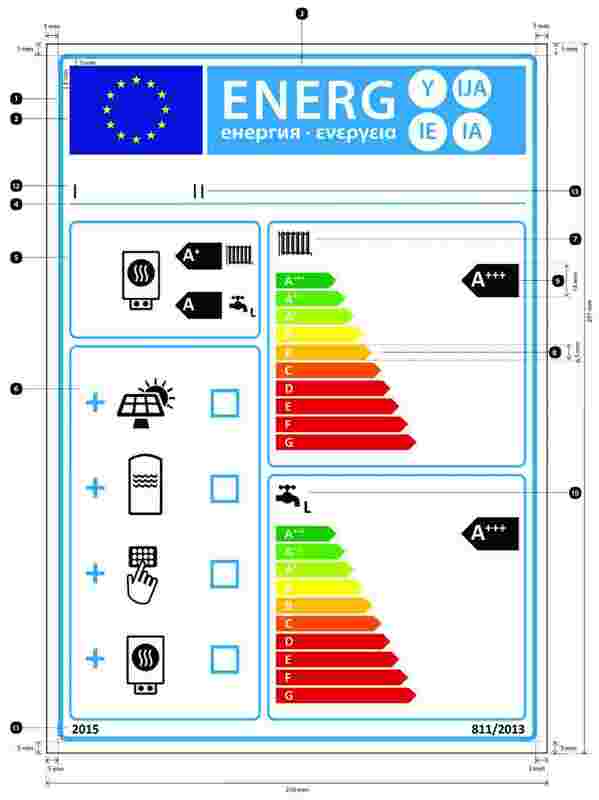 Pictogram as depicted: EU logo + energy label: width: 191 mm, height: 37 mm. Sub-logos border: 2 pt, colour: cyan 100 %, length: 191 mm. Border: 3 pt, colour: cyan 100 %, round corners: 3,5 mm. Text: Calibri bold 40 pt, capitals, white, ‘+’ symbols: superscript, aligned on a single row. Text: Calibri bold 12 pt. Dealer’s and/or supplier's name or trademark. The dealer’s and/or supplier’s name or trade mark and model identifier shall fit in a space of 191 × 19 mm. Pictograms as depicted; for water heating function, including the declared load profile expressed as the appropriate letter in accordance with Table 15 of Annex VII: Calibri bold 16 pt, 100 % black. Text: Calibri bold 28 pt, capitals, white, ‘+’ symbols: superscript, aligned on a single row. Pictogram as depicted, including the declared load profile expressed as the appropriate letter in accordance with Table 15 of Annex VII: Calibri bold 22 pt, 100 % black. (1) OJ L 27, 30.1.2010, p. 1.
the sound power level LWA , outdoors, in dB, rounded to the nearest integer. One fiche may cover a number of space heater models supplied by the same supplier. The information contained in the fiche may be given in the form of a copy of the label, either in colour or in black and white. Where this is the case, the information listed in point 1.1 not already displayed on the label shall also be provided. One fiche may cover a number of combination heater models supplied by the same supplier. The information contained in the fiche may be given in the form of a copy of the label, either in colour or in black and white. Where this is the case, the information listed in point 2.1 not already displayed on the label shall also be provided. the contribution of the temperature control to seasonal space heating energy efficiency in %, rounded to one decimal place. One fiche may cover a number of temperature control models supplied by the same supplier. the annual auxiliary electricity consumption Qaux in kWh in terms of final energy, rounded to the nearest integer. One fiche may cover a number of solar device models supplied by the same supplier. VI: the value of the difference between the seasonal space heating energy efficiencies under warmer and average climate conditions, expressed in %. III: the value of the mathematical expression , expressed in %, where Qaux is taken from the product fiche of the solar device and Qref from Table 15 in Annex VII for the declared load profile M, L, XL or XXL. (1) The intermediate values are calculated by linear interpolation between the two adjacent values. (2) Prated is related to the preferential space heater or combination heater. (3) The intermediate values are calculated by linear interpolation between the two adjacent values. (4) Prated is related to the preferential space heater or combination heater. any specific precautions that shall be taken when the space heater is assembled, installed or maintained. any specific precautions that shall be taken when the combination heater is assembled, installed or maintained. Parameters shall be declared for average, colder and warmer climate conditions. any specific precautions that shall be taken when the temperature control is assembled, installed or maintained. any specific precautions that shall be taken when the solar device is assembled, installed or maintained. any specific precautions that shall be taken when the package of space heater, temperature control and solar device is assembled, installed or maintained. any specific precautions that shall be taken when the package of combination heater, temperature control and solar device is assembled, installed or maintained. The size and font in which the information referred in point 1.1 is printed or shown shall be legible. The size and font in which the information referred in point 2.1 is printed or shown shall be legible. the elements set out in Figure 1, Figure 2, Figure 3 and Figure 4, respectively, of Annex IV. The size and font in which the information referred in point 3.1 is printed or shown shall be legible. the elements set out in Figure 5 of Annex IV. The size and font in which the information referred in point 4.1 is printed or shown shall be legible. 1. For the purposes of compliance and verification of compliance with the requirements of this Regulation, measurements and calculations shall be made using harmonised standards the reference numbers of which have been published for this purpose in the Official Journal of the European Union, or using other reliable, accurate and reproducible methods that take into account the generally recognised state-of-the-art methods. They shall meet the conditions and technical parameters set out in points 2 to 6. 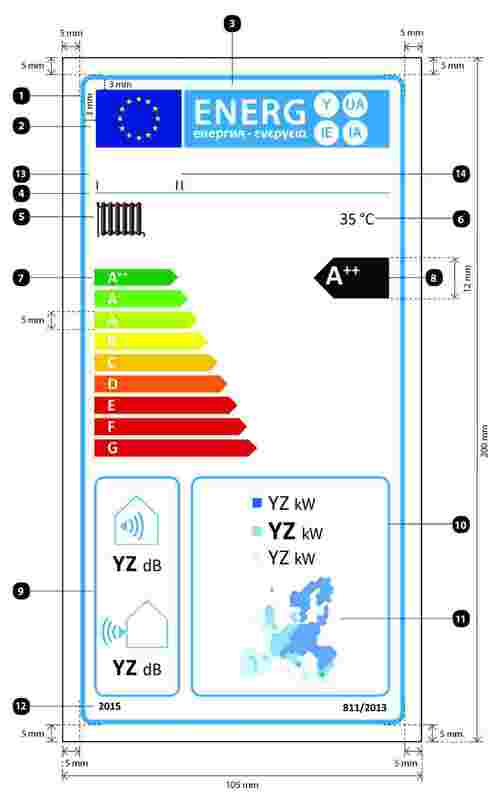 For the purposes of the measurements set out in points 3 to 7, the indoor ambient temperature shall be set at 20 °C. 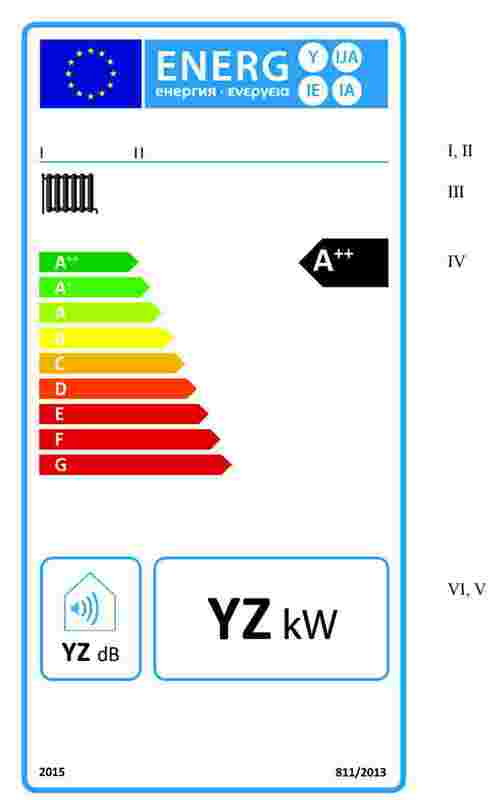 For the purposes of the calculations set out in points 3 to 7, electricity consumption shall be multiplied by a conversion coefficient CC of 2,5, unless the annual electricity consumption is expressed in final energy for the end-user, as set out in points 3(b), 4(g), 5(e) and 6. 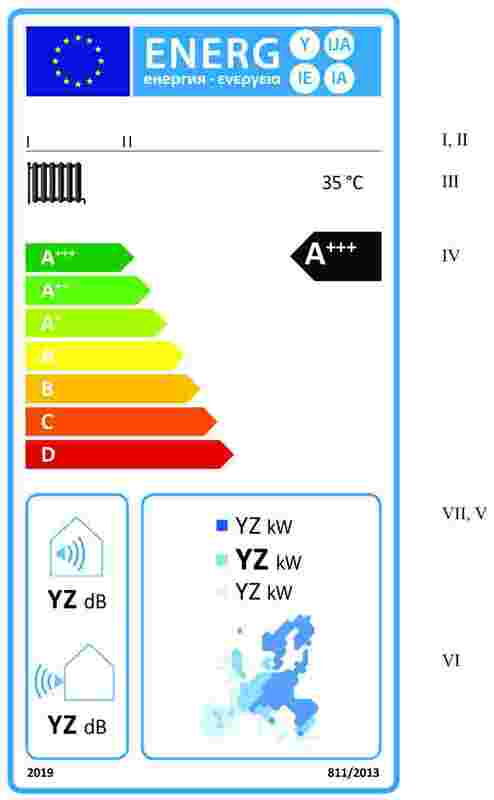 Declared values for rated heat output, seasonal space heating energy efficiency, water heating energy efficiency, annual energy consumption and sound power level shall be rounded to the nearest integer. The annual energy consumption QHE in kWh in terms of final energy and/or in GJ in terms of GCV shall be calculated as the ratio of the reference annual heating demand and the seasonal space heating energy efficiency. For establishing the rated coefficient of performance COPrated or rated primary energy ratio PERrated , or the sound power level, the operating conditions shall be the standard rating conditions set out in Table 9 and the same declared capacity for heating shall be used. if applicable, the effects of any degradation of energy efficiency caused by cycling, depending on the type of control of the heating capacity. The reference annual heating demand QH shall be the design load for heating Pdesignh for average, colder and warmer climate conditions, multiplied by the annual equivalent active mode hours HHE of 2 066, 2 465 and 1 336 for average, colder and warmer climate conditions, respectively. The seasonal coefficient of performance SCOP or seasonal primary energy ratio SPER shall be calculated as the ratio of the reference annual heating demand QH and the annual energy consumption QHE . 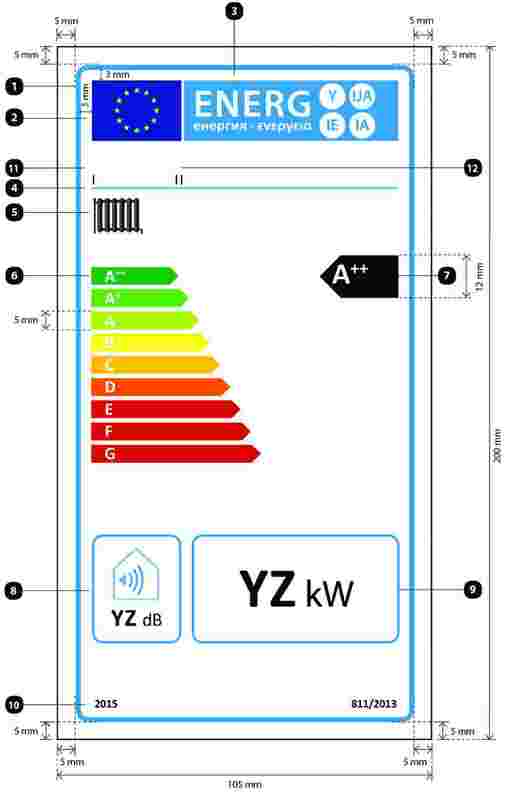 The annual energy consumption QHE in kWh in terms of final energy and/or GJ in terms of GCV shall be calculated as the ratio of the reference annual heating demand QH and the seasonal space heating energy efficiency ηs . the annual fuel consumption AFC in GJ in terms of GCV shall be calculated as daily fuel consumption Qfuel multiplied by 220. The solar collector, solar hot water storage tank and pump in the collector loop (if applicable) shall be tested separately. Where the solar collector and solar hot water storage tank cannot be tested separately, they shall be tested in combination. 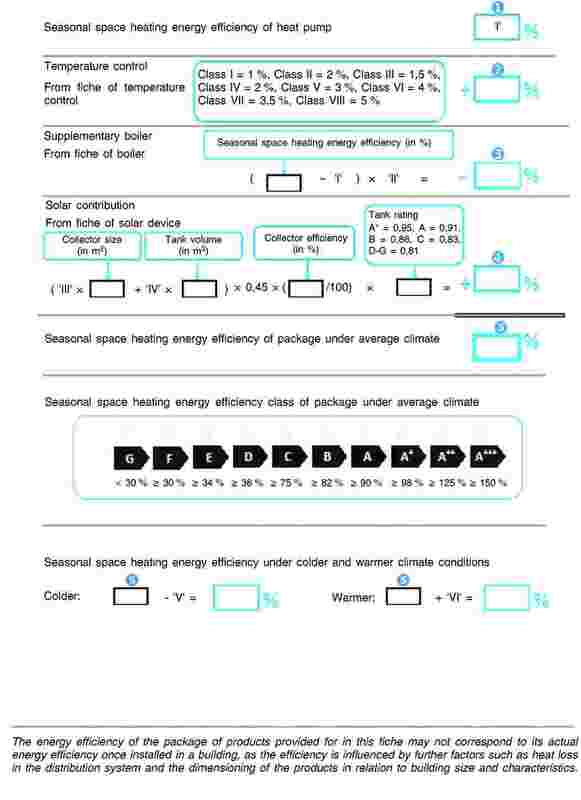 The results shall be used for the determination of the standing loss S and the calculations of the collector efficiency ηcol , the annual non-solar heat contribution Qnonsol for the load profiles M, L, XL and XXL under the average climate conditions set out in Tables 13 and 14, and the annual auxiliary electricity consumption Qaux in kWh in terms of final energy.